Apparently R is for Rivi today, because the young lady won't vacate my head and is BEGGING me to get to work on the second part of her story. Chill! Lets get the first one taken care of first! In the meantime I'd like to give you a peek of what is going into the second book... Ps- As I am still in the rough draft stage, this scene may or may not stay, I have not decided yet. Rivi opened her eyes and placed a hand on the edge of the patient's cot to steady herself. The world around her seemed to be spinning, with her at its center. Feeling slightly nauseated, she shook her groggy head and the world soon steadied itself. She looked up across the cot and the patient lying there to discover that there were five healers of different species looking at her in shock. Rivi frowned and looked up at Dan who was also coming to. He watched absently as the Gront patient laying on the cot in front of him slowly awoke. The blisters and boils on his face slowly disappeared, and the Gront sat up as if nothing were wrong. Dan continued staring blankly at the cot. “How do you feel?” one of the Aunantet healers asked. “I feel fine. Thanks! The Gront replied as he jumped off the cot and ran out of the tent. “Dan?” Rivi queried, still watching him. Dan blinked his eyes and turned to look at her. A smile spread across his face. “Huh? Oh, I'm fine. I'd best get back to work,” He replied with a laugh. “Go ahead, you! Just don't scare me like that again,” Rivi exclaimed, laughing, pushing him playfully on the shoulder. She shook her head as he laughed. Still feeling a bit dazed, she walked out of the healers’ tent and stumbled over the blackened ground of the Gront's home world. A cloudy sky cast dark shadows over everything. Rivi found a short rock wall nearby and sat down, trying to figure out what just happened. Rivi looked up and saw the comp amalgamator from the desk coming over to her. “I'm feeling … confused. Your name is Etok, right,” Rivi stated, querying the Aunantet's personal computer, discovering also that Etok was only a year older than she was. “Yeah. How did you do … Whatever you did in there?” Etok asked, looking at Rivi questioningly. “The two of you must be pretty close friends to be able to help each other like that,” Etok said as she sat down beside Rivi. 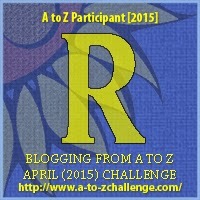 Today's post was also inspired by the letter R. R is for: Rivi as part of the Blogging from A to Z April 2015 challenge! Click on the letter to join on in the fun! For Readers: I know this isn't exactly flash fiction... yesterday and today were really busy days for me so I had to find substitutes. I am hoping to have some more breathing time tomorrow. Only 8 days left to the challenge! Would you like to give me a random S word (I'll pick one per person) to add into tomorrow's story? Thanks! I'll be happy to let you know when the new edition of the first book is finally released Tarkabarka. ;) It should be released some time in the next month. So glad you stopped by! Aww thanks Tyrean! I'm glad you guys liked it! Schlemiel huh... wow that is quite a word!